I'm here today with Nell Freudenberger. 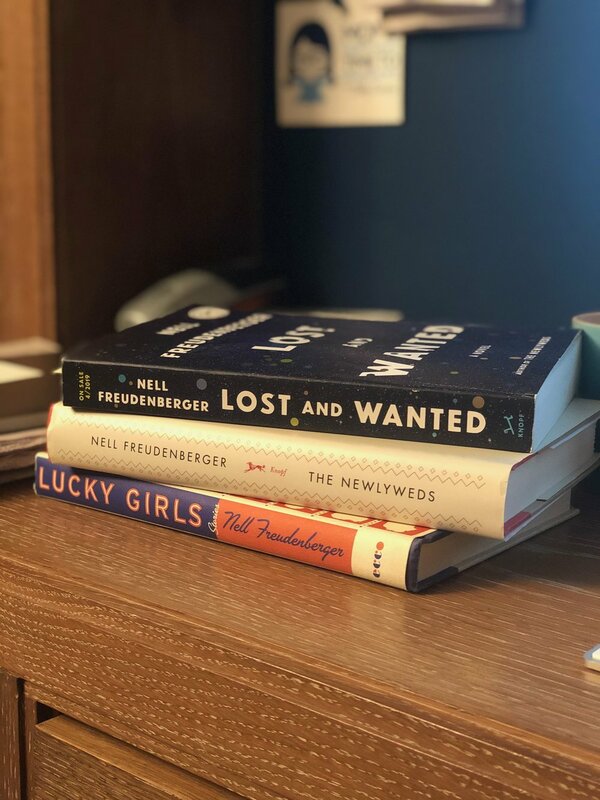 Nell is the author of the short story collection Lucky Girls and the novels The Dissident, The Newlyweds, and the upcoming Lost and Wanted, release date April 4th, 2019. She is a recipient of the Guggenheim Fellowship, a Whiting Award, and a Cullman Fellowship from the New York Public Library. She was named one of The New Yorker’s 20 Under 40, which I can now give up on ever attaining myself now that I'm forty-two. She graduated from Harvard and has an MFA from New York University. She currently lives in Brooklyn, New York, with her family. Nell Freudenberger: Thanks so much for having me. Zibby: Lucky Girls, your first collection of stories, was based on a story by the same title you had published in The New Yorker in 2001. I want to hear the story of how that happened. You were working at The New Yorker at the time. Go from there. Nell: I was working as an editorial assistant. I'd come there from an MFA program at NYU. I had some stories. I had a writing routine. I would usually get up before work and do a little bit, not a lot, an hour and a half or two hours in the morning. Zibby: I think that's kind of a lot before work. Nell: We were young then. It was easy to get up early. Publishing doesn't start at eight in the morning. I had a story. The New Yorker was doing a debut fiction contest that was for people who had never published before. That was definitely me. The only story I had that I felt comfortable showing it was finished took place in India. I thought at the time that I didn't have a right to write about that place. It wasn’t my place. I had spent a lot of time there. The time I was writing in the morning was a way to escape back there and be in a different world. That was what I'd been working on. I gave it to Bill Buford, who was the fiction editor. Most of the work was sent in or sent in by agents of writers who hadn’t published yet. Later, one of the other fiction editors told me that Bill had read it, and then they had all read it, and they said that they liked it but they thought the ending was really abrupt. It turned out that Bill had dropped the last four pages behind his couch, so a lot of luck in all sorts of ways. It was great. When it was published, it was really exciting. Zibby: Wow. What happened after that? Were you just over the moon? Did everybody come running and ask you to turn it into a collection? How did it turn in from that amazing story to the collection of stories? Nell: There were agents who were interested in it just because The New Yorker is that kind of platform. It wasn’t an amazing, happy -- it’s like you get what you've always wanted, and then it’s really scary. You feel under a spotlight. I remember it being kind of a tough time, feeling really self-conscious, and not sure that I could write a book of stories that was like that. I think I knew that was the best thing I had done so far. The old work that I had done, I had a novel that I had written in graduate school and some other stories. I knew that I would have to start over from the beginning. It was scary to sign a contract for a book that I didn't know if I could necessarily write. Nell: I was twenty-six. I was a reasonable age. I wasn’t that young. Nell: It’s so nice that people who were in business school had time to read fiction. Zibby: I don't know what I was doing in business school. I was a misfit. It’s so neat to now have seen your whole career progress over all this time from twenty years ago when you started. I never would have thought at the time when you were this rising star that you would be feeling insecure about it. I just assumed, “She must be over the moon.” It’s interesting to hear that wasn’t how you were feeling. Nell: For women especially, it was strange at that age to do photo shoots and be in magazines. I was just trying to be a writer. I was very grateful for the attention because it gave me the ability to leave my day job, which I loved, but the time to write the book. Selling the book in advance did that. It meant that I could go back to India and spend some more time there on my own. I had always been with a friend. I had never been on my own before and have that luxury of that time to write. I was grateful for it, but I didn't want my picture taken, necessarily. Zibby: A lot of your stories, and novels even, have focused on other cultures. Do you feel now that you have the right to write even if you're not from other places? Have you gotten over that initial fear that you had? Nell: It’s a really complicated question. Rightly, it’s become more a question of the moment. I realized quickly that I wasn’t writing about India or anywhere else I had been. I was just writing about being an American. It gave me a different lens on it, writing from within another place. I don't love the idea that we’re penned in by our cultural perspective. I think we should be able to write more broadly than necessarily where we came from. I also think that if you're doing that, you have to be aware that you have a responsibility to be clear about who you are when you're writing and why you're writing it. The times when I have written from a perspective that's not my own culturally, I try to put that into the book in some kind of way. In The Newlyweds, I was writing about a young woman from Bangladesh. There's another woman, an American woman, in that book who writes an essay for her for an essay contest. The heroine of the book wants to get a scholarship. This other woman helps her. I was hoping in that way to show that it was from my perspective. It was my idea of what this woman’s experience was like. She's based on a real person. We had agreed beforehand, I had asked her permission to write it. I still wanted it to be clear in the book that it was my idea of her life. Zibby: Wasn’t The Newlyweds based on a couple you met on a plane or something? Was that a different story? Nell: Yeah. I was flying to Rochester from New York City. My grandmother had just died. I was going to help my dad clear out her massively cluttered house. It was an emotional time for me. Maybe I was especially open to strangers sitting next to me on a plane. I don't usually talk to anybody on airplanes. I was reading a book by Amitav Ghosh that took place in the Sundarbans, that [indiscernible] area between India and Bangladesh. The woman sitting next to me said, “Is that an Indian writer?” I said, “Yes, but the book is set in Bangladesh.” She said, “That's where I'm from. I'm from the Sundarbans,” that particular area of Bangladesh which is really distinct and special in its geography and wildlife. We started chatting. It turned out she had just moved to marry this man who she met online. They didn't know each other very well. They had spent nine days together in Bangladesh before they decided to get married. He had never left the United States before he took that trip. That's an unusual first trip abroad. She had never been out of her own country. They were both on the plane. I chatted with her more. I was fascinated by the idea that they were ready to yoke their lives together in this way. They are still married. They live in Florida. They have two kids. Zibby: I was going to ask what happened to them. Wow. Nell: We started corresponding over email. It was amazing to me to watch not only her -- she already spoke English and she had almost taught herself, she's a very smart person -- to watch her English get better, but also to watch her perspective on her new adopted city change. She was so over the moon about Rochester when she first got there. She made me see things about it that as a snotty kid coming from New York City, I thought it was kind of a backwater -- where my grandparents lived -- which is ridiculous because it’s a industrial city. It has all sorts of classic American businesses. There’s Xerox and [indiscernible]. She was amazed especially by the air quality. They had a lilac festival there. She thought that was one of the most beautiful she had seen. She couldn't believe how much space there was and how good the air was. If you're coming from Dhaka, that is notable. Then her perspective became a little bit more nuanced. She started to feel like the friendliness that she experienced when she first got there, that there was another layer to it. It wasn’t quite as easy to be welcomed as she had first thought. She started seeing bias in a way that she hadn’t before as her language got better and she started to understand what was underneath people's words. That also was fascinating to me. She had said, in the way that South Asian people often do when you're travelling in India, when I first met her, she said, “You'll have to come and meet my family.” It’s just a politeness. Then we decided we were really going to do that. We went back together. We had a funny experience. When we had planned to take the same flight -- my dad always says having grown up there, every flight out of Rochester, like nine of out ten will be grounded for snow. That happened. I was coming from New York City. I got to JFK. They weren’t there. They weren’t going to make it for the flight. I went, obviously. I had my ticket. When I got there, her parents were waiting for me at the airport. They didn't speak English. I went back with them to their apartment. They showed me to her room. I slept in her bed that night with her parents in that apartment without her. It was so strange. Farah and I had already talked about how I was going to try to write this story. To wake up in her childhood bedroom as I was trying to imagine who she was at that age was really -- then to struggle to communicate with her parents was amazing. She and her husband arrived a few days later. We had a really wonderful trip together. Zibby: Isn't so weird that if you had just been reading a different book on that flight, none of that would've happened? Zibby: -- a friend? [laughs] Maybe it wasn’t the book. Nell: We had things to offer each other. Zibby: How did you take that whole experience and turn it into a novel? Did you just sit down and start doing it? Did you have to outline the book? How did you translate it into fiction? Nell: I am so inefficient. I was just at a writing group in Brooklyn. We were talking last night. Someone was talking about how they were outlining their book. God, if you can do that from the beginning, it must be so comforting. It’s just not the way I work at all. I have to figure out who the people are. I do a lot of extra writing that I always end up throwing away. The plot comes in a secondary way that I think is slow, but I'm not sure how else to do it. Zibby: You base it more on the characters and then see what happens? Nell: I have to find the voice of the book and then things start happening, but it’s slow. Zibby: Then you moved on from The Newlyweds. No, The Dissident was before The Newlyweds? Nell: Yeah. I wrote The Dissident and then The Newlyweds. Zibby: What inspired that novel, The Dissident? Nell: I grew up partly here and then in LA. When I was ten, we moved to LA. It was inspired by a Chinese artist who came to visit our high school. He had kind of a residency in our high school. He was teaching us traditional brush painting. I kept going back for his little, informal classes. I really liked learning that. I had spent some time in the Met in the CC Wang wing. I was interested in the idea of copying and originality, the idea that originality was so important in Western art and that in China it was a different method. At least in traditional Chinese art, there was a lot of copying of and learning from a teacher. I wanted to explore that. I had the idea of a man like him coming to Los Angeles and staying with this wealthy family. My best friend in elementary school was from a really glamorous Chinese family. They had this house in Beverly Hills. I told my mom when I first went to play there, I would pretend that I was a princess when I was there. That house was really impressed in my memory. I thought I would set it in that house and write about this man. My husband and I went, before we were married, and interviewed some of the artists who are part of the Beijing East Village. Their work also influenced who the character became. Zibby: You did The Dissident and then The Newlyweds, and now Lost and Wanted. How long has it been between these books? Have you been working on this book the whole time? How long has this book been in the works? Nell: It’s been a while. I sold this book in 2013. It really was a different book at that time. I wrote a whole draft that I ended up getting rid of. This book probably took about two years. There were three years before that of writing around. Zibby: I was stunned as I was reading it. I was like, “How does she know this much about physics and all the science?” Did you study all that? There was so much detail and texture to all of that information. Nell: There might be too much detail for some people. Zibby: No, oh gosh. I didn't mean it that way. I'm sorry. Nell: I worried that I got too dorkily immersed in the science. The thing that made me throw away the old draft and start this one was that I really wanted the narrator to be a physicist. When I had written the other draft, I made her a writer. It was too close. I did want to write something that was set in the United States and was a little bit closer to my experience. That included the experience of being a mother. When I was writing about her as a writer, it was so boring to me. I think the character was boring. There was a physicist in the book, but I had safely made it a man who was a secondary character so I wouldn't have to understand the physics. Then I thought to myself, “It’s always worked better when an idea seems like something I couldn't do, that's too hard. Maybe I should try.” I got in touch with an astrophysicist who I had known in college. I said, “I want to start at the beginning. I don't have a science background. Can you recommend a very basic college textbook, like Physics for Poets?” He sent me one. From there, the wonderful thing about learning about physics is that there are so many people whose hobby is reading about it that there are so many books for a general audience. Some of the best physicists in the world write for regular people. Discovering that and then discovering the online archive of physics papers that are published in journals, all of that is accessible. You don't even need an account or a password. It’s one of the most open places on the internet that I've ever found. It was really exciting to see that once I'd done a little bit of the background reading -- I could never understand the math that goes with it. One physicist said to me, “We don't read the math either unless we think it’s wrong.” That was very encouraging, the idea that you could take something away, not what a scientist would take away, but something from these papers. I met some amazing people at Columbia and MIT who took me on tours of their labs. I was especially interested in LIGO and the gravitational wave detection project. It was incredible to walk through those places with the people who are working there. Physicists are fabulous to talk to. Everyone I know is obsessed with their work and loved trying to make it clear for an outsider. Zibby: Actually, Mr. Peppiatt, my physics teacher in high school, was one of my favorite teachers of all time. Maybe there's something to that. That's my one data point on physics. Nell: I took a physics class in high school where we -- it was an all-girls school in LA. It wasn’t really physics. It was called Physical Science. It was a mash-up with chemistry. The one thing I remember is testing the pH of our different shampoos and comparing them. It was pretty basic. This was exciting for me. Zibby: I didn't mean to imply there was too much physics. I did feel a little bit smarter. Nell: There may be too much physics. Zibby: I felt smarter reading it. I was like, “Wow. Now I'm actually learning other stuff.” It’s a side benefit. I get this great story, but I feel a little bit more intellectual. Nell: Same with writing it. If you're going to spend five years working on a book, it is really nice to learn something at the same time. Zibby: Did you base it on the friendship between Charlie and…now of course I'm blanking on her name. Zibby: Yes, Helen and Charlie. Was that based on a friendship that you had? Nell: That I still have. Charlie’s really a whole bunch of people together. I had a really close friend in college who I'm still friends with. She lives somewhere else. It’s hard to keep in touch. I thought when I was starting to write this book that for years romantic relationships seemed important. There was always a romance in the books. That feeling of loss especially, love ending, was important, especially for the first book of stories. I thought if I could write that about romantic relationships, why would it be any less powerful to write it about a friend who I felt in a certain way I had lost? At this point in my life, that loss was resonating more than old boyfriends I had forgotten about. Nell: Right. When someone dies and you realize that there was this time that you had that you could've -- at this point, we’ve all lost a friend in a more permanent way. You realize, “God. There were all those nights. What was I doing when I could've been out with him or her?” It seems incredible at this age when suddenly someone's life is cut short. There was that too, trying to write about grief. Nell: That's nice. That's the goal with fiction. Zibby: I read one interview that you did with Women on Writing. You said that you write very slowly so you don't always time to share your work. You mentioned just now of course that it took you several years. How slow is slow? Do you have a word count a day? Do you just meander? Is it that you write slowly or that you take your time to think through the stories? Nell: I don't remember saying that. I definitely share my work before. Nell: I have friends who I show things to. I have this wonderful group of women in Brooklyn. We don't actually share work at our meetings because most people are teaching as well and have families. You don't want to add extra homework. We do make individual partnerships within the group. I have some other old writing friends who I share with. I do more of a sit down, three hours sort of thing. The word count seems kind of counterproductive to me because you can put words down and they're not the right words. I try to just get to my desk. It’s different than it was before I had kids. I was very regimented, which is characteristic of my personality in general. I really like to have to the same three hours of new writing time. Then in the afternoon, I do a lot of freelance work. Before my kids were born, I would be working on an article or maybe going back to what I had done in the morning and revising. To have those hours that were supposed to be for new writing, I still try to stick with that, although I'm not quite as good at it now. Zibby: You don't do any teaching, do you? Nell: I don't. I occasionally teach a class at the Y or something or visit classes. I'm not employed at a university. Zibby: You do some freelancing now? Nell: I do a little bit, sometimes an essay or a book review or something. Zibby: What do you want to have happen next in your life? Are you going to do another book for the next couple years? Zibby: -- Oh, stop. You can't call yourself old because that’s insulting me. Nell: I would like someday to be able to publish a book of all the stories. The stories, they're a little bit less influenced by anyone else. Stories are edited, usually, but usually only after they're accepted somewhere. It’s usually light editing. I feel like they're the place where I can do the most experimenting. If I have an idea that seems really weird to me, I can try it. Someday I would love to collect all the stories together. I'm not in a rush to do that. They feel like absolute free play time. Zibby: It should be fun, right? Do you feel a little more confident now at this stage of life than when you were starting out with all that pressure on you? When you have a book coming out now, how do you feel about going into the publicity of this and the reception of it? Are you as nervous as you were when you were younger? Nell: No. I definitely have moments of it. I am definitely more confident speaking in front of people. Public speaking is something I had to grow into. I think I understand it a little better now. Zibby: You seem great to me. We’re not public. It’s in my office. Nell: This is easier. I'm grateful when people read the book. I'm happy to visit book clubs and go to a bookstore where people want to come listen. It’s nice a lot of times when you can have a conversation instead of just stand up there and read. I think a lot of people like that more. Bookstores are more open to all different kinds of formats now. It has gotten easier. Zibby: I'm going to one tonight with four people talking for the launch of a book, in Brooklyn actually. I agree. Those are really fun to watch. There should be a way for people who can't end up going to the book events to see all that great content. Nell: Absolutely. Julie Orringer and I started this group in Brooklyn. We met because we were doing an event in Phoenix with our first books. Her husband was also there. He had his book out at that time, and then it was another writer. It was in a bar, but it was outside. It was near the airport. There was planes flying overhead. We were like, “Oh, my god. How's this going to work?” It was actually a fabulous event because they were serving beer. It’s so simple, but it needs to feel fun. It’s much nicer to listen to somebody read from their work of literature while you're drinking a beer. Nell: Then more people, the more writers the better. Zibby: Will your whole schedule be on your website? Nell: It will. I actually am only just making a website right now, which I probably should've done earlier. It will be on my website, Twitter. Zibby: Good. Do you have any advice to aspiring authors? Nell: Definitely. If you're not already a completely passionate reader, then there's no point in doing it. Reading is how you learn. Writing every day is really helpful. Also, most of us, myself included, don't know what our interesting stories are. We think that there's something that people want to hear. What's interesting about you is almost never what you think is interesting about you. Writing the thing that scares you or the thing that you can't forget but seems too strange or too hard is probably the way to go, to push yourself to do what's uncomfortable. Zibby: Thank you so much. I really enjoyed talking to you. Good luck with the launch. It’s really exciting. Nell: Thank you so much for having me.